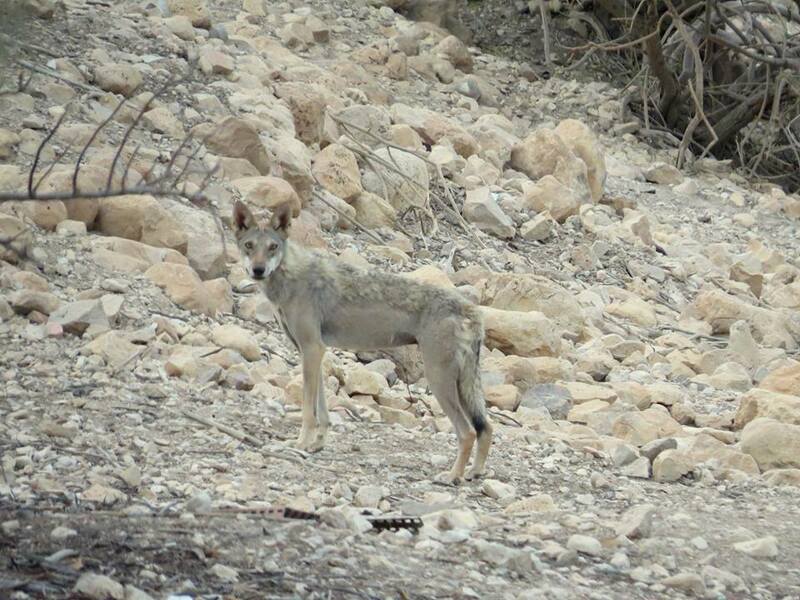 We tend to associate grey wolves with forested valleys and frozen peaks – but in the arid deserts of southern Israel, you'll find a unique subspecies of the cunning canids. These Arabian wolves are perfectly adapted to the rocky cliffs they call home, as seen in a daring chase scene filmed in the Ein Gedi Nature Reserve. The wolf's slender physique confused many commenters online, with some suggesting it was actually a jackal or coyote. At about 40 pounds (18kg), Arabian wolves (Canis lupus arabs) are indeed smaller than their better-known kin, but this animal is perfectly healthy. The clip was filmed by Nature and Parks Authority supervisor Matan Bogomolsky, who watched from a nearby plateau as the impressive hunt played out. The agile prey is a juvenile Nubian ibex, a wild mountain goat species known for its impressive, backward-arching horns. "During the chase, the wolf and the kid showed each other their innate abilities in athletic leaps and fast runs between the cliffs," says the reserve team [translated from Hebrew]. "The wolf determinedly obtained what he wanted, likely to feed the members of his pack and small offspring." The team notes that while the hunt may be tough for some viewers to watch, it's a perfect example of the underrated biodiversity of this desert ecosystem – and the important role predators play in maintaining its balance. "This kind of pursuit is the natural and normal course of living in nature," they say. "It is difficult for the onlookers to avoid intervening in favour of the goat, but that would not help the wolves, which play a significant role in nature, such as regulating the population of ibexes and other animals. It is important to allow natural foraging in order to maintain a healthy nature reserve." Once found all across the Arabian Peninsula, the subspecies now survives only in small corners of Southern Israel, Oman, Yemen, Jordan, Saudi Arabia and possibly in parts of the Sinai Peninsula in Egypt. Wild populations are estimated at 850-1,200 individuals, with only around 100 wolves roaming Israel. Some viewers have expressed concern that the wolf's "uneven" pelt might be a sign of mange, but this is not the case. During winter, Arabian wolves sport thick coats to insulate against freezing temperatures, but most of that fur is shed as seasons change. To help protect the animals against the heat of the summer sun, longer hair remains along their backs. This recent sighting was particularly interesting to the reserve team because the predators typically hunt at night. The decidedly unfussy eaters will consume anything from deer and rodents to birds, reptiles and even berries – but daytime foraging is rarely witnessed. "It probably indicates that the wolves at this time of the year have a new generation of offspring and therefore require a great deal of food," says the team, stressing that reserve visitors should never attempt to feed the animals. "Exposure of the wolves to food and human waste can change their behaviour," they explain. "This is wild nature at its best." If a litter of pups is indeed located nearby, the newborns will likely stay concealed for some time, since Arabian wolves escape the heat by digging deep dens. We'll certainly be keeping an eye out for any sightings of the youngsters. The world's most threatened canid faces some serious threats – but there is hope.